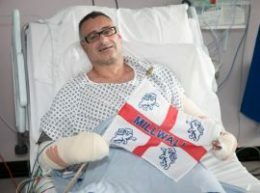 During the chaos of the London Bridge jihadist attack on the evening of June 3, 2017, a forty-seven-year-old man named Roy Larner took on three machete-wielding Muslim terrorists with his bare hands and lived to tell about it. Hero Roy told The Sun from hospital: “They had these long knives and started shouting about Allah. Then it was, ‘Islam, Islam, Islam’. Yes, we are all Millwall now. Of course, this kind of sports-as-identity thing is not new. It’s as natural as loving your mother, and it’s what powers the professional sports industries in nearly all civilized nations. Earlier this year, the Chicago Cubs won their first World Series in ninety-nine years. Thirteen years before that, the Boston Red Sox won their first in eighty-six. You can bet that citizens of both cities were engorged with local pride for many months after their teams’ respective moments of glory. The great hockey movie Miracle touches on this as well, as coach Herb Brooks beat the collegiate allegiances and regional rivalries out of his young players until they identified as Americans first and foremost. Combat sports have it, too. Light welterweight champion boxer Ricky Hatton always wore the blue of Manchester City in the ring, as if bringing his hometown with him every time he fought (not that it was necessary, given that his fans showed up in rowdy, trumpet-honking droves wherever he went). And don’t even get me started on what Youngstown, Ohio meant to 1980s lightweight champ Boom Boom Mancini, or what Toms River, New Jersey means to current UFC featherweight contender Frankie Edgar. People eat this stuff up. Such beautifully shameless geography-signaling reaches its apotheosis in literature in the matronly form of Miss Pross. As you work your way through the Western canon, you will realize that there is no one else like her. Without giving away too much of the plot, Charles Dickens in his A Tale of Two Cities sets up the audacious rescue of an innocent Englishman, Charles Darnay, who is doomed to the guillotine during the French Revolution. The rescue is carried out in Paris by Darnay’s wife Lucie, her father Dr. Manette, the heroic Sydney Carton, and several friends of the family, including the aforementioned Miss Pross. A lovable, irrepressible cockney, Miss Pross speaks in such honest, idiomatic English that no matter who you are or where you are, if you’re a native-born English speaker, then Miss Pross reminds you of home and makes you want to defend it. For years she has expressed nothing but fierce loyalty to her beloved “Ladybird” and her family, and Dickens is about to put her to the test of her life. Every second counts as the group initiates its escape, and, in order to avoid suspicion in the streets, Miss Pross directs the last of her male accomplices to meet her at a cathedral a few hours later. Alone in the apartments of Lucie and her young daughter, Miss Pross then meets with the diabolical Madame Defarge. Without being able to understand one another – both are provincial creatures, only knowing the language of their respective nations – they nonetheless size each other up in an epic stare-down. Miss Pross, crying tears of determination, recognizes this villain as the family’s mortal enemy. Madame Defarge, in turn, suspects that this blubbering British peasant is hiding Lucie Darnay and her daughter behind one of the closed doors of the apartment. What follows is a quick and savage fight which encapsulates British nationalism’s struggle with continental globalism. It’s ancient fealty and tradition caught in a desperate death match with the modern Enlightenment and nihilism. Indeed, it’s the “Thrilla in Manilla” of catfights, with the two women tearing into each other for the kill. But as happened with Mr. Larner by London Bridge, it’s not only what Miss Pross does to Madame Defarge, but what she says to her which makes this scene so crucial for the survival of the West. Madame Defarge’s dark eyes followed her through this rapid movement, and rested on her when it was finished. Miss Pross had nothing beautiful about her; years had not tamed the wildness, or softened the grimness, of her appearance; but, she too was a determined woman in her different way, and she measured Madame Defarge with her eyes, every inch. Madame Defarge looked at her scornfully, but still with something of Miss Pross’s own perception that they two were at bay. She saw a tight, hard, wiry woman before her, as Mr Lorry had seen in the same figure a woman with a strong hand, in the years gone by. She knew full well that Miss Pross was the family’s devoted friend; Miss Pross knew full well that Madame Defarge was the family’s malevolent enemy. This is exactly the attitude that every white Westerner should carry with him when facing down these invading jihadi maniacs. These are our lands, and we need to marry our identities to them once again. I am an Englishman. I am an American. I am a Frenchman or a Spaniard or a German. I come from Manchester or Barcelona or Strasbourg or Cologne. I root for this team or that. You could be from Schenectady, New York and pull for the Oneonta Tigers. I don’t care. It doesn’t matter. We are who we are. They will never get the best of us because we are men of the West . And right now, we are all Miss Pross. We are all Millwall.